V-groove casters and wheels designed and built by National Caster Corporation meet track and rail specifications, as well as being able to perform without track. Using grooved wheels is a time tested method efficiently raising workloads off the floor and bringing workflow control to an optimum level. Regardless of model or style, we have the v-groove units you need. Call to speak with a representative to select your caster. Call Toll Free 1-888-904-9531 to purchase V-Groove Casters and Wheels. V-Groove wheels are designed to roll on flat surfaces as well as on tracks and rails. This is advantageous to controlling workflow and getting loads up off the floor. Many V-Groove wheel casters and wheels are designed to handle high weight capacities. 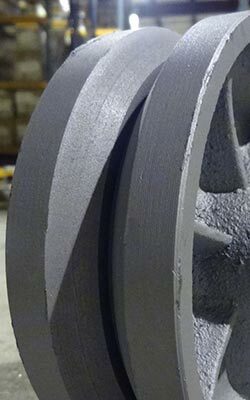 National Caster builds ductile v-groove wheels for applications that will be under heavier shock and stress. These ductile wheels provide more strength than standard cast iron or other wheel materials, enabling the wheel to better absorb heavier shocks. Using a high temperature Phenolic wheel would enable a tracked unit to easily be rolled in and out of high temperature areas such as a bakery oven. V-Groove wheels in various composition types, such as steel, ductile, or phenolic can handle a variety of environments and industrial situations depending upon usage. Several brake and bearing options are available on v-groove caster units. Fastening and mounts types available according to need.